Choker love is in the air. These neckpieces can complement almost any outfit. Chokers are very much in trend and are being sported by the big names in the world of fashion. From celebrities to fashion bloggers to fashion enthusiasts, choker has gained some real attention and will surely be here for long. If you are still hesitant about trying the trend, let me help you take some inspiration from celebrities who rocked chokers! Learn it from Miranda Kerr to slay in a casual chic look. Pair a basic tank with your favorite skinny jeans and boots. Add the twist with an interlinked choker neckpiece. The Gone Girl star rocks her basic outfit with a twist. Steal her style by pairing jeans with a button down shirt and a choker that matches the fabric of the shirt. Add a pop of color with your sling bag. Who does not remember how much attention Sonam Kapoor attracted during 2014 Cannes Film Festival with this beautiful Anamika Khanna dress! We loved every bit of the look. The gold mesh and pearl choker played icing on the cake. Recreate this look by pairing an ethnic gown or saree jumpsuit with a sheer jacket and an ethnic style choker. Off-shoulders and chokers are a match made in heaven. 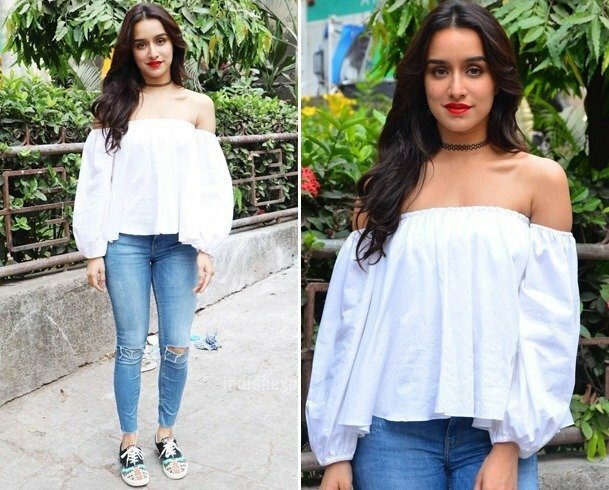 Shraddha Kapoor redefines ‘casual chic’ with this outfit. Steal her style by pairing a white Bardot top with everyday denim, sneakers and a tattoo choker. Add a hint of drama with bold red lips. She has been winning hearts all over the world, with her amazing sense of style. Recreate this outfit with a tank top, a glamorous cape and chic side swept curls and a conspicuous metal choker. Pair your silver choker neckpiece with a denim shirtdress. Add a hat and knee-high boots for added glamour. You can get the same look wearing a choker without burning a hole in your pocket. Take one of your turtleneck sweaters or tops and layer it with a metal choker on top. It can be either silver or gold, depending on what you like and try to stay away from the leather or rubber kind as those tend to cheapen down the look. Learn it from Candice to get the basics right. She pulls off this 90s trend and how! You too can sport this outfit. Just layer a basic bodycon dress with a plaid shirt, ankle boots, a velvet choker and you are good to go. Alia keeps experimenting and stunning us with new styles. This is another picture that inspires us to try both culottes and chokers. You too can wear it like her with a pair of culottes, a denim bralet, a blazer and an open-front gold choker. Rosie Huntington-Whiteley complemented her choker with a sweet tiered Gucci gown. Pair yours with a maxi-tank dress. Seek out a choker cut from a fancier cloth, like black lace for a classy look. Finally! What! You can wear a choker with is your saree? Take inspiration from Dia Mirza, who pairs a pretty simple gold and white saree with a kundan choker. Keep other jewelry minimal to balance out the look. How Much Do Celebrity Makeup Artists Get Paid?